Refurbished EK-XLC Predator All-In-One at a discounted price! 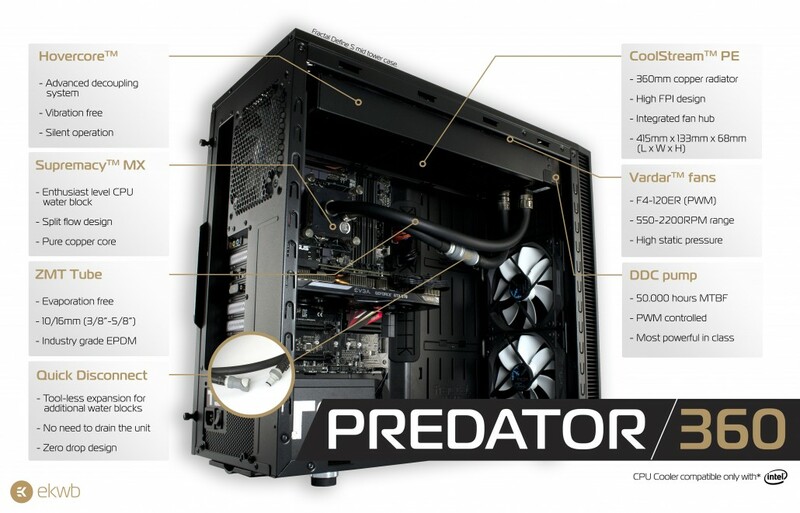 EK Water Blocks, Slovenian premium liquid cooling gear manufacturer, is releasing refurbished EK-XLC Predator all-in-one liquid cooling units. This is a special time limited offer, and a great chance to get EK-XLC Predator at a discounted price! Refurbished units are customer returns that were returned under warranty due to the product recall. Revision 1.0 units were recalled due to the defective O-ring on the Predator CPU water block. Since then, Revision 1.1 has been in production with improved mounting mechanism for easier installation process. Every faulty O-ring was replaced and every unit is verified to function properly, and is thus free of defects. Refurbished units might have slight imperfections on the radiator fins, but do not affect the overall function of the unit in any way. EKWB has redesigned and released a new version of EK-XLC Predator (Revision 1.1) on the 4th of January 2016 and like every new Predator, every refurbished EK-XLC Predator is upgraded to Revision 1.1 and has a full two years limited international warranty. Hovercore is a new, revolutionary design of radiator de-couple ring that effectively prevents transfer of pump induced vibrations from the unit to the computer chassis itself, thus resulting in vibration-free and silent operation. CoolStream PE 360mm radiator, has a full copper core superior to aluminum alternatives in terms of heat dissipation. In conjunction with EK-Vardar fans the result is increased performance across an entire fan operational range, thus delivering results both at low- and high airflow operation. Vardar fans – three on Predator 360 – are high-static pressure fans developed in-house specifically for liquid cooling systems. With low noise profile and PWM technology built in, the system always controls the RPM and keeps the fans silent while maintaining excellent cooling performance. DDC pump is a powerful 6W liquid cooling pump providing 2-3x higher flow rate compared to other AIOs on the market. It’s also PWM controlled, allowing for automatic pump speed regulation depending on your CPU temperature. Full performance on demand or whisper quiet operation in idle mode! The CPU water block is compatible with all modern Intel sockets, as well as AMD platform, with the purchase of EK-XLC Predator AMD Upgrade Kit. Predator 240 and Predator 360 feature integrated Quick Disconnect Connector (QDC), a special no-spill connector that allows quick and tool-less expansion of the system without the need for draining of the unit. This allows users to effortlessly add a pre-filled QDC-enabled GPU water block. Click the video below and see the QDC in action! 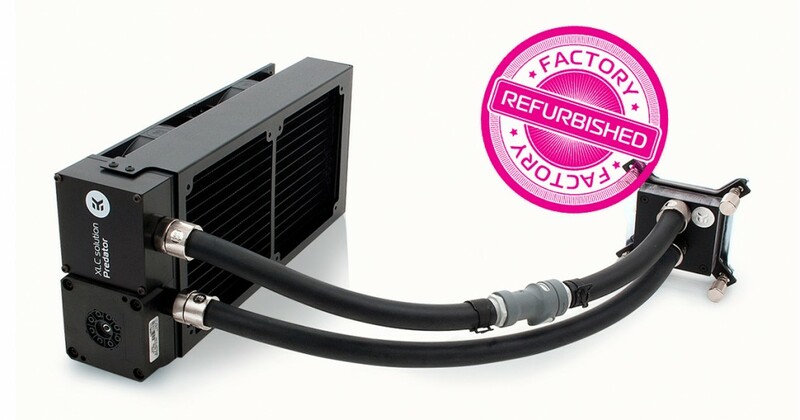 Refurbished by EK Water Blocks in Slovenia, Europe, the units are available for purchase through EK Webshop. In the table below you can find a manufacturer suggested retail price with VAT included.